Mish's Global Economic Trend Analysis: Continuing Claims Drop First Time In 21 Weeks. Is This Worth Getting Excited Over? Continuing Claims Drop First Time In 21 Weeks. Is This Worth Getting Excited Over? Unless this is another headfake, the string of 21 consecutive weeks of higher continuing claims ended today. Interestingly, the 4-week moving average of continuing claims actually rose. Previously I reported the streak ended at 17 unless the numbers were revised, but revised they were. With that backdrop, please consider the Department of Labor Weekly Claims Report. In the week ending June 13, the advance figure for seasonally adjusted initial claims was 608,000, an increase of 3,000 from the previous week's revised figure of 605,000. The 4-week moving average was 615,750, a decrease of 7,000 from the previous week's revised average of 622,750. The advance seasonally adjusted insured unemployment rate was 5.0 percent for the week ending June 6, a decrease of 0.1 percentage point from the prior week's unrevised rate of 5.1 percent. 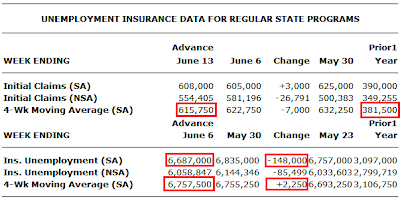 The advance number for seasonally adjusted insured unemployment during the week ending June 6 was 6,687,000, a decrease of 148,000 from the preceding week's revised level of 6,835,000. The 4-week moving average was 6,757,500, an increase of 2,250 from the preceding week's revised average of 6,755,250. For six weeks I have been saying the dip in initial claims from the March peak of roughly 650,000 is not accelerating very fast, if indeed at all. In three months the 4-week moving average of initial claims has gained roughly 35,000 jobs. For the sake of argument let's call it 15,000 jobs per month. At that rate it will take another 4 months just to get to where we were a year ago and those were God awful numbers at 381,500 claims a week. Of course things might speed up significantly, then again I was reasonably generous with the initial rate of improvement. Yahoo Finance is reporting Jobless benefit rolls post first dip since January. On the surface, the government seemed to signal Thursday that more Americans are finding jobs: The number of people receiving unemployment aid fell for the first time since early January. But that doesn't necessarily mean more companies are hiring. Fewer people are receiving jobless aid largely because more of them have exhausted their standard unemployment benefits, which typically last 26 weeks. Government figures, in fact, show the proportion of recipients who used up their jobless benefits in May topped 49 percent, a monthly record. Given that the proportion of recipients who used up their jobless benefits topped a monstrous 49 percent, the continuing claims number going forward will be essentially meaningless. Indeed, the primary reason we set these records in the first place is that many states extended benefits. Looking ahead, expect the administration to highlight the huge drop in continuing claims as if it means something necessarily good. It doesn't. The drop in continuing claims means more home foreclosures and credit card defaults are coming because 49% of those who were receiving benefits now have no money coming in at all. Finally, The drop in initial claims is insignificant in relation to the problem. Beware of future spin on meaningless "improvements" because it is coming.